Source: All pictures are the copyright of Ian Grant. The single seat cockpit will be home to the pilot for up to five days at a time. 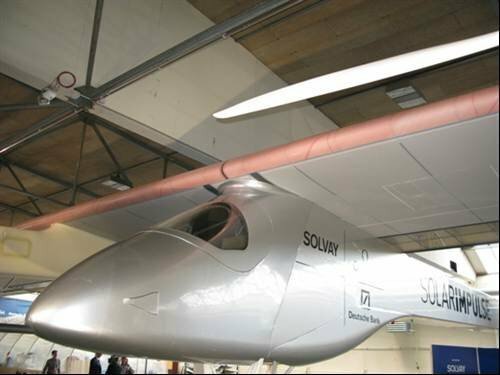 Solar Impulse HB-SIA, the world’s first aircraft the first aircraft designed to fly around the clock without using fossil fuel or polluting the planet, was unveiled at a Swiss military airfield last week. The project, which aims to show how new technology can be harnessed to fight climate change, is the brainchild of adventurer Bertrand Piccard and fighter pilot Andre Borschberg. It follows from the world’s first non-stop flight around the world in a balloon by Piccard and Brian Jones in 1999. Following a 2001 study into the feasibility of a solar powered circumnavigation flight, engineer and fighter pilot Borschberg joined as project manager. The €76m project began formally on 28 November 2003. Dassault Aviation, which designed and built the Mirage fighter, offered to help with the aero-elasticity and flight commands, safety and system reliability. Through that relationship, Dassault Systemes, the computer aided design and manufacture firm, sponsored a full design capability for seven engineers. Robert Fraefel, head of the design team and manager of structural production for the aeroplane, said it would have been impossible to develop the project in just six years without computerised help. “Mr Borschberg kept saying to us, ‘This is a risky project – take risks!’, but as an engineer, you still want a margin of safety,” he said. Fraefel, whose previous job was designing cars for the Sauber Formula 1 team, said the main challenge was having a completely blank sheet of paper. “Usually you make small improvements to an existing part, but we had nothing to guide us except the maths and the physics calculations. Fortunately, they all worked perfectly, and sometimes even better in practice than in design,” he said. The intensity, six days a week for three years, forged a close family spirit among the 15 core members of the team. “We even had two marriages and a couple of births,” Fraefel said.